The primary and most important objective behind the enactment of Limitation act was to protect the defendants and to provide the justice to the rational and genuine litigants not to those who consider the law as endless weapon to harass the defendant. The Plaintiff with a valid claim and cause of action should be allowed to file claim diligently. Defendant who has lost the evidence due to time lapse should not become a victim of law. Perusal or proceeding with a case whose cause of action arose long back is injustice. The aforementioned decision is based upon many reasons out of which the most essential one is the Section 433 of the Companies Act which already makes the limitation act applicable upon any applications/petitions/appeals fled before National Company Law Tribunal or National Company Law Appellate Tribunal before the enactment of IBC, 2016, therefore validating the applicability of Limitation act on IBC. An application filed under the IBC cannot revive the long pending debt. 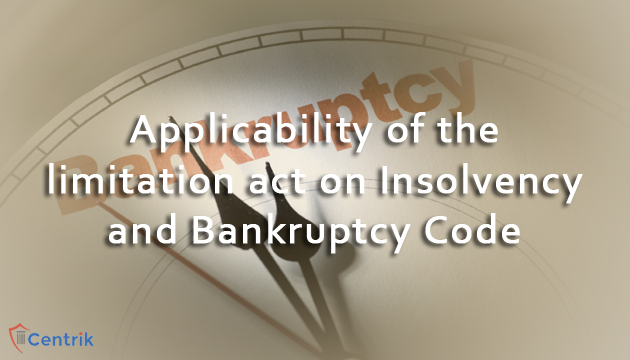 The applicability of the Limitation Act upon IBC i.e. section 238 A shall be construed retrospectively in nature. The definition of debt due under the IBC means the debt which is outstanding as well as payable in law against which the claim can be filed. The default which is become due 3 years prior to filing of the application under IBC will be considered time barred, thus barred in law. Therefore it is clear from the above observations that even though IBC has arrived recently it does not mean it has the power to revive the due already dead in law or allow the litigant to harass the defendant or defaulter against the dead debt or bad debt regarding which no action was taken prior to the coming of IBC. Also section 238A of the IBC upholds the applicability of Limitation act on IBC. While considering the implementation of Limitation Act, Section 137 of the Limitation Act will be applied upon any application or petition or claim or appeal is filed before the adjudicating authority or tribunal i.e. NCLT or NCLAT.